Definition at line 215 of file ntuser.h. Definition at line 228 of file ntuser.h. Referenced by CallNextHookEx(), co_CallHook(), co_HOOK_CallHookNext(), co_HOOK_CallHooks(), NtUserCallNextHookEx(), NtUserMessageCall(), and NtUserSetWindowsHookEx(). Definition at line 226 of file ntuser.h. Referenced by IntFreeHook(), IntGetNextHook(), IntUnhookWindowsHook(), and NtUserSetWindowsHookEx(). Definition at line 221 of file ntuser.h. Definition at line 217 of file ntuser.h. 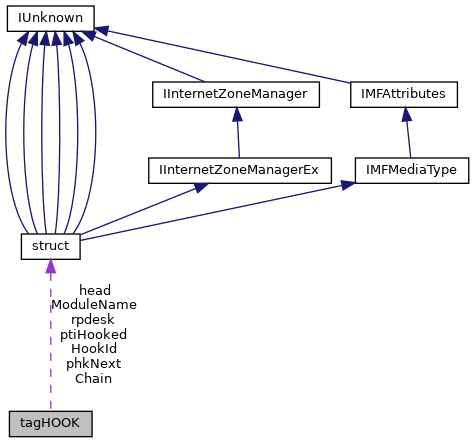 Referenced by co_HOOK_CallHooks(), co_IntCallLowLevelHook(), IntGetGlobalHookHandles(), IntUnhookWindowsHook(), and NtUserSetWindowsHookEx(). Definition at line 219 of file ntuser.h. Referenced by CallNextHookEx(), co_HOOK_CallHookNext(), co_IntCallLowLevelHook(), co_UserCallNextHookEx(), IntGetNextHook(), IntRemoveHook(), NtUserMessageCall(), and NtUserSetWindowsHookEx(). Definition at line 222 of file ntuser.h. Referenced by co_CallHook(), co_HOOK_CallHookNext(), co_HOOK_CallHooks(), NtUserMessageCall(), and NtUserSetWindowsHookEx(). Definition at line 229 of file ntuser.h. Referenced by co_CallHook(), co_HOOK_CallHookNext(), co_HOOK_CallHooks(), IntFreeHook(), NtUserMessageCall(), and NtUserSetWindowsHookEx(). Definition at line 220 of file ntuser.h. Definition at line 218 of file ntuser.h. Referenced by CallNextHookEx(), co_HOOK_CallHooks(), NtUserCallNextHookEx(), NtUserMessageCall(), and NtUserSetWindowsHookEx(). Definition at line 227 of file ntuser.h. Referenced by co_CallHook(), co_HOOK_CallHookNext(), co_HOOK_CallHooks(), co_UserCallNextHookEx(), IntUnhookWindowsHook(), NtUserMessageCall(), and NtUserSetWindowsHookEx(). Definition at line 223 of file ntuser.h. Referenced by co_IntCallLowLevelHook(), IntGetNextHook(), IntRemoveHook(), and NtUserSetWindowsHookEx(). Definition at line 224 of file ntuser.h.